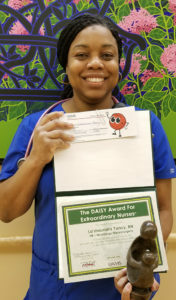 Please join the Center for Nursing Excellence in congratulating La’shaundra Yancy, RN for being selected as the DAISY Award recipient for the month of November! La’shaundra works on H8 – Neurology/Neurosurgery and was nominated by a co-worker. The nomination below reflects how La’shaundra impacted their life in a very special way. To learn more about The DAISY Award or to nominate a deserving licensed nurse, please visit: http//nurses.uams.edu.